Purchase Does God Have a Future? The nature of God’s knowledge of the future, sparked by the openness of God debate, is perhaps the most controversial issue in evangelical circles today. It has generated much heated discussion in venues like the Evangelical Theological Society. This book counters such intense discourse by pairing Christopher Hall, who affirms the historic Christian or classical view, with John Sanders, one of the foremost proponents of the openness view. 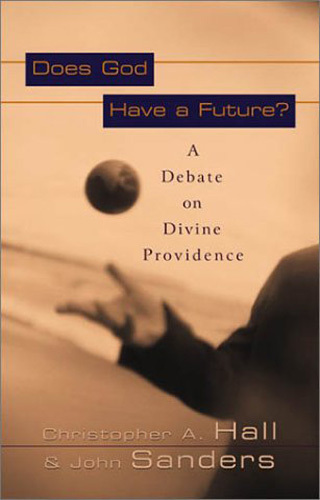 For over a year, Hall and Sanders engaged in a friendly yet penetrating e-mail exchange responding to one another’s questions and concerns about God’s providence and foreknowledge. This book is a compilation of those inquiring e-letters, offering equal handling of both the classical and openness views. Motivated by the belief that evangelicals must learn how to disagree without becoming divisive, they display their respect for each other while vigorously disagreeing about important issues. The e-mail format has produced a series of to-the-point exchanges that make this complex topic more accessible and far more instructive and digestible than a pair of pro-con essays would have been. As such, it is the ideal introduction to the contemporary debate. This book is an expanded version of a two-part article that appeared in Christianity Today in 2001. All those interested in a serious, balanced presentation of the openness debate, without unfair caricatures, will appreciate this theologically sophisticated yet accessible book.